The best bonnet hair dryers to choose from depend on the hair type and needs of an individual. 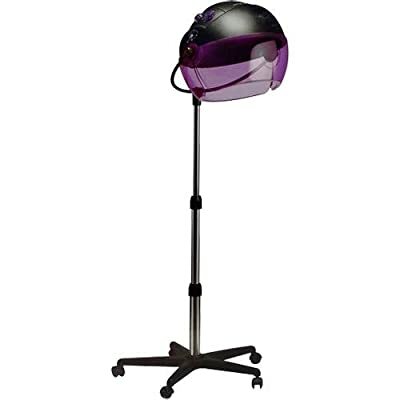 Bonnet hair dryers allow users to quickly dry their hair while at the same time retaining moisture and smoothening it. These products reduce the stress of styling hair and also helps to save preparation time while on a tight schedule. There are different types of bonnet hair dryers to choose from. The review will help you to choose and buy the best product. The Babyliss is a hair dryer that comes with three distinct temperature settings. It is a dryer with a stand that is adjustable in height. In addition, the bonnet may also adjust using the lift-up visor. This is very convenient as it allows the user to enter and exit the device effortlessly. Most noteworthy, 1600 watts power the dryer. The excellent device design has an ionic technology. This technology enables it to dry hair faster, reduce hair frizz and condition hair. All these functions ensure the user obtains shiny, smooth and soft hair after use. Another important feature to appreciate is the wheeled base. The wheels allow the movement of the bonnet hair dryer from one place to another in the house. This Babyliss product works well when deep conditioning hair. Furthermore, one may use hair rollers comfortably. Drying hair with this product takes approximately 20 minutes when the temperature setting is high. Also, since it is standalone, there is no need to hold it enabling one to carry out other activities for example reading. The product is a dryer that uses the ionic technology. 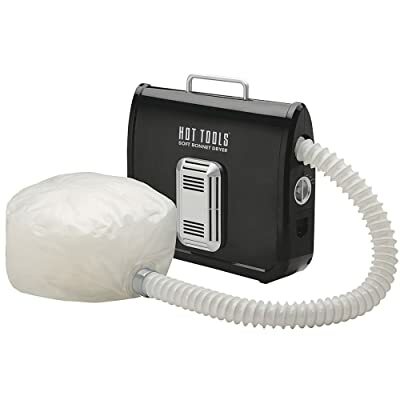 The technology allows the drying of hair using heat and air flow. 800 watts power this hair dryer. There are two main sections of the dryer, a purple connection and a white bonnet worn on the head. It also comes with a carrying case. The bonnet space is adequate to accommodate users of different sizes. Also, it easily allows the use of hair rollers no matter the size. Furthermore, the bonnet has elastic drawstrings that help to secure the device. In addition, this hair dryer is very light weighing 3.5 pounds and thus portable. Most importantly, the product has three temperature settings. Also, it works well to dry hair and reduce hair static. However, the cap might be oversize for individuals with a small frame. Another drawback of the Laila Ali is that the hose tubing connecting the two sections becomes very hot especially with long use. This may lead to burns and thus the recommendation of using a towel for cover. The Tourmaline 1059 is a unique product with two pre-moisture system drying technologies. The hair dryer uses tourmaline and ionic technologies. Furthermore, it is powered by 1875 watts which is higher than many of the bonnet hair dryers. Most noteworthy, the power and two technologies allow this dryer to dry hair up to 50% faster. The design of the 1059 dryer from Hot Tools allows for heat and speed options. The speed options are two, while the temperature options are four. 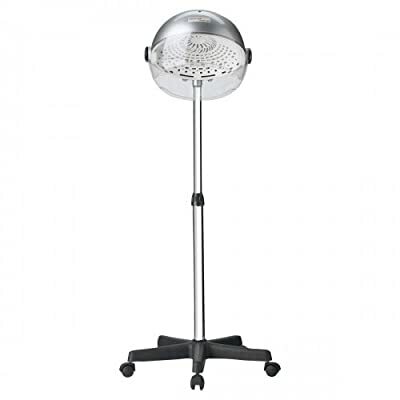 The dryer is similar to the Babyliss with a wheeled stand that adjusts in terms of height. In addition, it has a cord nine-foot in length and the two wheels are lockable. The legs of the dryer are removable allowing for storage. Another great feature is the front visor and bonnet that is adjustable. The bonnet allows users of different sizes to fit comfortably. Moreover, the use of rollers of different sizes is possible. The product significantly suits individuals with long and thick hair. This is because of the high settings of heat available. It also ensures that hair dries well without frizz. The Hot tools professional is a product created with the ethnic consumer in mind. It uses an ion-infused airflow technology that facilitates the quick drying of hair. The technology conditions ions enabling the hair to retain moisture reducing breakage. Furthermore, it ensures hair is shiny and smooth. Most importantly, the dryer gets hot even at the lowest heat setting. This minimizes the need to use the highest setting. The features create the need for users to protect themselves using towels. The use of the high heat setting for an extended period is also not recommended. The product is light thus easy to carry around. It has a white bonnet, a cord and a storage compartment. It is suited for drying hair with rollers, wavy styles, braids and wigs. The pink hair dryer is a product with a large hood capacity and unique configuration. It has ventilation holes that are 140 in number distributed in the crown of the hood and drum. The holes allow for fast and even distribution of heat. The product is suitable for conditioning treatments. Most noteworthy, securing of the product is possible using the chin strap. The chin strap is easily adjustable to suit different users. Apart from the chin strap, there are side fitting draw strings to secure it further. 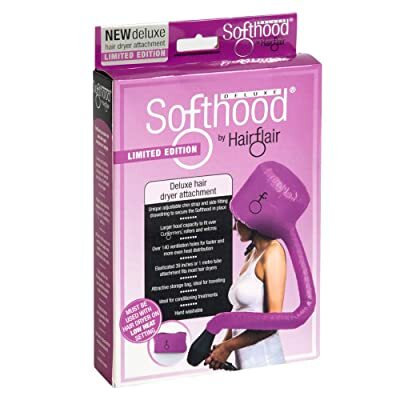 The Deluxe soft hood hair dryer requires a blow dryer to work. One needs to purchase it separately. However, the hose collar is compatible with many of the hand held dryers in the market. It fits dryers with nozzles up to 2.25 inches. There are two main types of bonnet hair dryers. There are the soft and hard bonnet hair dryers. The soft bonnet hair dryers are small, travel-friendly and cheaper. They are also easy to store since the bonnet is foldable. Hard bonnet hair dryers, on the other hand, have a rigid bonnet and thus semi-portable. They are semi-portable because the lower sections are removable allowing for storage. The cost of these types of bonnet dryers is higher. It is advisable to choose the type of dryer depending on the storage space you have and flexibility required. The budget is also a determinant when choosing between a hard and soft bonnet dryer. The power of most hair dryers starts at 800 watts. Maintaining power between 800 to 1100 watts is vital. The range ensures that hair breakage and weakening is minimized. Too much heat on hair is discouraged. In addition, the product chosen should have different heat settings. This allows the user to choose the best depending on the hair type. The most popular heat settings include low, medium and high. Based on the kind of dryer, caution is advised since some of the products heat up and cause injury to the skin. There are low and high-cost products. Choose a product that fits your budget. The key is to ensure that it meets the basic features that suit your needs. The size of the dryer is affected by the space the user has. It should be able to occupy minimal space. The size also determines how portable a product is especially for users always traveling. Also, the size of the bonnet should be large enough to accommodate individuals of different sizes and frames. Furthermore, the use of rollers, curl formers and velcros should be accommodated. The bonnet hair dryer chosen should be able to dry your hair quickly. The best time is 20 to 40 minutes. Extended exposure of the hair and skull to heat is harmful. 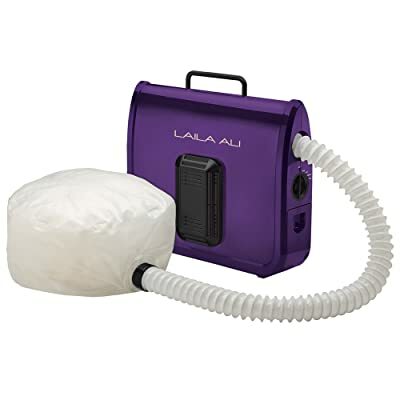 From the review of the best bonnet hair dryers, I would recommend the Laila Ali LADR5604 Ionic Soft Bonnet Dryer. It is a lightweight and compact product convenient at home and when traveling. The dryer also works efficiently to dry hair by evenly distributing heat. The size of the bonnet accommodates different users and it is secure since it has elastic drawings. Finally, the power is sufficient and there are three heat settings to choose from.